October 10th, 2011 | Wheaton World Wide Moving. In 1945, Earnest S. Wheaton founded our company as Clipper Van Lines with our first move taking place from Canton, Ohio, to Constantine, Michigan. We started out with an original authority for 22 states in the eastern United States. In the 50s we changed our name to Wheaton Van Lines, Inc. and started our expansion to the rest of the country, ultimately going international by the time the decade was through. In 1973, Wheaton became the first carrier in the nation to hold complete 50-state authority from the Interstate Commerce Commission. The 80s was a big decade for us with another name change (to our present Wheaton World Wide Moving), the adoption of our Employee Stock Ownership Program (which plays a large role in the great customer service our patrons receive), and being named one of the top 101 service companies in America (by the book, “The Service Edge”). We kicked off the new millennium by thinking small – becoming a corporate sponsor of Give Kids The World, a non-profit resort for children with life-threatening illnesses whose wish is to visit Central Florida’s attractions. 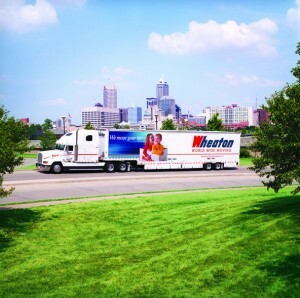 Today, Wheaton has grown from our humble beginnings to a worldwide moving company by never losing sight of our single-minded focus: we move your life. Take a look at our complete timeline to see even more highlights of the Wheaton World Wide Moving history.